Any secret worth keeping is a secret worth telling, which is why the average secret's lifespan is about that of a mayfly -- 30 minutes to a day, depending on the ratio of "Juiciness of Information" to "Consequences for Not Keeping Your Big Mouth Shut". Now taste a secret that's managed to stay unrevealed for over 145 years: Victoria. Just now crossing the border nearly a century and a half after its first brewing, this caramel-colored lager's long enjoyed a peerless reputation all across Mexico -- legend has it that the beer was spread far and wide by independence-minded troops in 1910, and that it possibly even put the "Â¡Viva" in "la Revolución!". While some scandal-mongers whisper that Victoria was created to be as good as any Vienna-style beer, that's not entirely true, as it was in fact created to be better; with a medium body and slight malt sweetness, it's smooth and refreshing, and in contrast to other dark beers, it packs a clean, crisp finish comparable to a flawless gymnastics dismount golf-swing follow-through. There are even tales that Gambrinus, the patron saint of beer, appears every time someone pours a perfect glass -- which may be because he's printed on all Victoria bottles, or because he enjoys personally admiring every bottle he's printed on. 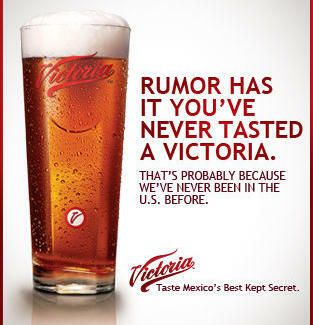 Victoria's journey into the heart of America will start in Chicago, then advance across the country city by city, until the identity of the premier Mexican lager is a secret that's wet every big, thirsty mouth in the country.